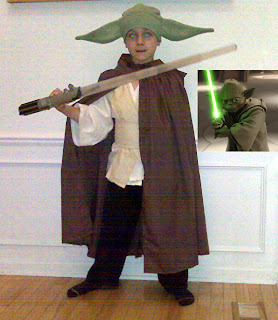 I don't know if this only applies to my kids, but minds are changing as often and quickly as the Michigan weather around here: Just last Saturday, Yanic insisted on being Yoda for Halloween. However, come Sunday afternoon and my being done with creating about 80% of his costume, he decides Yoda's ears are too big and he does not want to be Yoda anymore. He'd rather be Anakin Skywalker. I am not really mad about it, only because I did not have to make a second costume. He will just re-use the one I made for him a couple of years ago when he wanted to be Luke Skywalker. Oh, I love it! The ears are great. Oh, and I got your ornament... thank you so much! Too sweet of you. Even if the ears are too big or not,I think it's super cute! Ok, maybe a little big...but think of all of the LOOKs and maybe EXTRA candy he would get if he wore them!! Have you worked that angle yet, mom?? :D I think it came out great!